The St. Louis Cardinals are one of baseball's most storied franchises, and as much a part of St. Louis as Anheuser-Busch and the arch. From Lou Brock to Matt Carpenter, Ozzie Smith to Yadier Molina, Bob Gibson to Adam Wainwright, from Hall of Famers to rookie busts, the Cardinals are beloved in St. Louis. 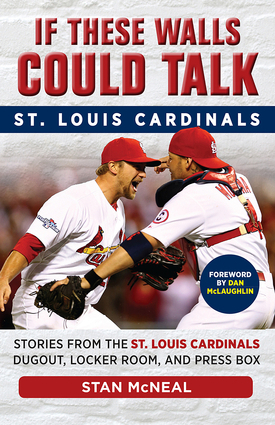 In this book, Stan McNeal provides a closer look at the great moments and the lowlights that have made the Cardinals one of the baseball's keystone teams. Through the words of the players, via multiple interviews conducted with current and past Cardinals, readers will meet the players, coaches, and management and share in their moments of greatness and defeat. This book shares stories behind such Cardinal memories as the little-known clubhouse antics of backup catcher Bob Uecker during the teams' memorable run in the 1960s, the excitement at Busch Stadium in the 1980s as the Cardinals reached the World Series three times, and the elation of the 2006 and 2011 World Series championships. Stan McNeal is a veteran sportswriter who has written for FOX Sports Midwest since 2013 covering the St. Louis Cardinals, Rams, and Blues for the site. He is the former managing editor and national baseball writer for the Sporting News. He lives in Chesterfield, Missouri. Since moving from Brooklyn to Los Angeles in 1958, the Dodgers have had an eventful—and frequently successful—history. From playing in the 100,000-seat Coliseum to five World Series titles, from Fernandomania to Mannywood, and from Sandy Koufax to Clayton Kershaw, the Boys in Blue have long been a team to watch. This history of the Dodgers provides a closer look at the great moments and the lowlights that have made them one of the seminal teams in the major leagues. Through multiple interviews conducted with current and former players, readers will meet the athletes, coaches, and management and share in their moments of triumph and defeat. The author recalls key moments in Dodgers history such as the building and breakup of the Garvey-Lopes-Russell-Cey infield, the sad decline of Steve Howe, the amazing comeback at the tail-end of the 1980 season, and the Frank McCourt saga. If These Walls Could Talk: Los Angeles Dodgers brings the storied history of the team come to life. Over the last half-century, the Philadelphia Phillies have experienced epic highs—World Series titles in 1980 and 2008—and frustrating lows, and Larry Shenk has been there for every minute of it. He provides a behind-the-scenes look at the personalities and events that have shaped the franchise’s history. The book gives the detailed scouting reports on Jimmy Rollins and Chase Utley and takes readers into the clubhouse as Steve Carlton closes in on 300 career wins. Listen in on Pete Rose’s phone call with President Reagan after Rose broke the National League hits record and see Richie Ashburn’s face when he heard he was elected to the Baseball Hall of Fame. Giving fans a taste of what it’s like to be a part of the Phillies’ storied history from a perspective unlike any other, readers will also learn about a man whose work ethic and character has made an impact on the players and staff for 50 years. Providing a behind-the-scenes look at the personalities and events that have shaped the Detroit Tigers’ recent resurgence, readers will meet the players, coaches, and management and share in their moments of greatness, grief, and quirkiness. Beginning in 2002, when author Mario Impemba arrived in the Tigers’ broadcast booth and when the team had consecutive 100-loss seasons, the book details how, in just three shorts years, team president Dave Dombrowski and manager Jim Leyland led the Tigers to the American League pennant—a feat the Tigers repeated in 2012. Impemba takes readers into the Comerica Park broadcast booth alongside the legendary Ernie Harwell, onto the team plane during the team’s two runs to the World Series, and into the clubhouse as Miguel Cabrera closed in on the 2012 Triple Crown. He shares personal stories about several Tigers stars, including Cabrera, Justin Verlander, Prince Fielder, Curtis Granderson, Ivan Rodriguez, Kenny Rogers, Magglio Ordonez, and more. If These Walls Could Talk: Detroit Tigers gives fans a taste of what it’s like to be a part of the Tigers storied history from a perspective unlike any other. Known simply as "America's Team," the Dallas Cowboys are one of football's most storied franchises and always begin each season with a legitimate chance to add another Super Bowl title to their existing five. Author and Cowboys employee Nick Eatman, through interviews with current and past players, provides fans with a one-of-a-kind, insider's look into the great moments and the lowlights throughout the team's history. Readers will hear from players, coaches, and management as they discuss their moments of greatness as well as their defeats, making If These Walls Could Talk: Dallas Cowboys a keepsake no fan will want to miss. The Chicago Bulls are one of basketball's most storied teams—from Michael Jordan, Scottie Pippen, and Phil Jackson to Hall of Famers and MVPs, the Bulls' NBA championship legacy will likely never be surpassed. Author and Bulls' beat reporter Kent McDill provides a closer look at the great moments of the 1990s championship teams, which saw the Bulls win six championships in eight seasons. Through multiple interviews conducted with current and past Bulls, readers will meet the players, coaches, and management and share in their moments of greatness and defeat. If These Walls Could Talk: Chicago Bulls will make fans a part of the Bulls' history from a new perspective. The New York Yankees are one of baseball's most iconic franchises and as much a part of New York as the Statue of Liberty and the Empire State Building. From Joe DiMaggio and Derek Jeter to Babe Ruth and Masahiro Tanaka, from Hall of Famers to rookie busts, the Yankees are baseball's most beloved franchise. Jim Kaat, who has the unique experience of playing for the Yankees as well as calling games for them in the booth, had a prime seat to watch it all unfold. In this book, Kaat and Greg Jennnings provide a closer look at the great moments and the lowlights that have made the Yankees one of baseball's keystone teams. Through the words of the players, via multiple interviews conducted with current and past Yankees, readers will meet the players, coaches, and management and share in their moments of greatness and defeat. Readers will find access to the clubhouse as Kaat recounts moments such as Jeter's last contest at Yankee Stadium; David Wells' perfect game; and the elation of the 1996, 1998, 1999, and 2000 World Series championships. It is a book that New York baseball fans will not want to be without. Firsthand tales of the most memorable moments in Cornhusker football history A traditional powerhouse, the Nebraska Cornhuskers are one of the most successful NCAA football teams, with five national championships and the highest winning percentage of any program over the last half century. Authors Jerry Murtaugh, an All-American linebacker at Nebraska in 1970, Jimmy Sheil, George Achola, and Brian Rosenthal, through interviews with current and past players, provide fans with a one-of-a-kind, insider's look into the great moments, the lowlights, and everything in between in Cornhuskers history. Readers will hear from players, coaches, and administrators as they discuss their moments of greatness as well as their defeats, making If These Walls Could Talk: Nebraska Cornhuskers a keepsake no fan will want to miss. Chronicling the Brewers from the Suds Series of 1982 to the 2011 National League Central title and from Bambi's Bombers of the late '70s to Harvey's Wallbangers of the early '80s, Bill Schroeder, a longtime Brewers color commentator and former Brewers catcher, provides insight into the Brewers inner sanctum as only he can. Read about what goes on in the equipment and training rooms, how batting practice can be chaotic, what it's like to travel with the team, and off-the-wall anecdotes like the time Steve Sparks injured his shoulder trying to rip a phone book in half after listening to a motivational speaker. The Green Bay Packers are one of the most successful teams in the NFL, with 13 world championships and four Super Bowl wins. Authors Wayne Larrivee and Rob Reischel through interviews with current and past players, provide fans with a one-of-a-kind, insider's look into the great moments, the lowlights, and everything in between. Readers will hear from players, coaches, and personnel as they discuss their moments of greatness as well as their defeats, making for a keepsake no fan will want to miss. A closer look at the great moments and the lowlights from one of the NFL's most historic teams Written by Lomas Brown, the former Detroit Lions offensive tackle who paved the way for Barry Sanders, and Mike Isenberg, this work is an insider's account of the last 20 years of the team's history. A behind-the-scenes look at the era, Brown shares stories about coaches from Wayne Fontes to Jim Caldwell and stars including Barry Sanders, Calvin Johnson, Matthew Stafford, Ndamukong Suh, and more. This book covers all of the successes and failures, elation and embarrassment of recent Lions history, making it essential reading for any fan. Chronicling the Clemson Tigers from the national championship in 1981 to the college football playoff in 2015, the authors provide insight into the Tigers' inner sanctum as only members of the Clemson athletic department can. Whether you're a fan from the Danny Ford era or a new supporter of Dabo Swinney, this book is the perfect read for anyone who bleeds orange and regalia. The San Francisco Giants are one of baseball's most storied franchises. Through the words of the players, via multiple interviews conducted with current and past Giants, readers will meet the players, coaches, and management and share in their moments of greatness and defeat. Haft recounts stories from this decorated Giants dynasty, which earned World Series rings in 2010, 2012, and 2014. Giants fans will not want to be without this book. The Baltimore Orioles are one of baseball's most historic franchises. Through the words of the players, via multiple interviews conducted with current and past Orioles, readers will meet the players, coaches, and management and share in their moments of greatness and defeat. Dempsey recounts moments from the 1983 World Series championship, the rise of Cal Ripken Jr., and the current team under Buck Showalter. Orioles fans will not want to be without this book. With their 2015 World Series championship, the Kansas City Royals claimed their spot among baseball's top current franchises. Through the words of the players, via multiple interviews conducted with current and past Royals, readers will meet the players, coaches, and management and share in their moments of greatness and defeat. Montgomery recounts moments with George Brett, Willie Wilson, and Mike Sweeney as well as the current squad under Ned Yost, including Eric Hosmer and Alex Gordon. Kansas City fans will not want to be without this book. From the days of Bobby Clarke, Bernie Parent, and the Broad Street Bullies, and up to the current era with stars like Claude Giroux and Shayne Gostisbehere, Lou Nolan has lived and breathed Flyers hockey as the team's longtime public address announcer. In If These Walls Could Talk: Philadelphia Flyers, Nolan provides insight into the Flyers' inner sanctum as only he can. Featuring conversations with players past and present as well as off-the-wall anecdotes only Nolan can tell, this is your rinkside ticket to some of the most memorable moments and characters in Philadelphia hockey history. Led by stars like Walter Payton, Jim McMahon, Mike Singletary, William "Refrigerator" Perry, head coach Mike Ditka, and defensive coordinator Buddy Ryan, the Chicago Bears in the 1980s were an NFL powerhouse. As anyone who's seen "The Super Bowl Shuffle" surely knows, they were also an unforgettable group of characters. Otis Wilson, the Bears starting outside linebacker, was right in the center of the action, and in this book, Wilson provides a closer look at the great moments and personalities that made this era legendary. Readers will meet the players, coaches, and management and share in their moments of triumph and defeat. Be a fly on the wall as Wilson recounts stories from those days in Chicago, including the 1985 Super Bowl-winning season. If These Walls Could Talk: Chicago Bears will make fans a part of the team's storied history. The Detroit Red Wings are one of the most successful and unparalleled teams in the NHL, with 11 Stanley Cup victories and a perpetual playoff presence. Author Ken Daniels, as the longtime play-by-play voice for the Wings, has gotten to witness more than his fair share of that action up close and personal. Through singular anecdotes only Daniels can tell as well as conversations with current and past players, this book provides fans with a one-of-a-kind, insider's look into the great moments, the lowlights, and everything in between. Citizens of Hockeytown will not want to be without this book. The Boston Red Sox are one of the most iconic teams in Major League Baseball, with nine World Series championships and countless greats who have donned the Sox uniform. In If These Walls Could Talk: Boston Red Sox, former player and longtime broadcaster Jerry Remy provides insight into the team's inner sanctum as only he can. Readers will gain the perspective of players, coaches, and personnel in moments of greatness as well as defeat, making for a keepsake no fan will want to miss. The New England Patriots are one of the most successful teams in the NFL, with five Super Bowl championships and a perpetual playoff presence. Author Scott Zolak, as a broadcaster and former player for the Patriots, has gotten to witness more than his fair share of that history up close and personal. Through singular anecdotes only Zolak can tell, as well as conversations with current and past players, this book provides fans with a one-of-a-kind, insider's look into the great moments, the lowlights, and everything in between. Pats fans will not want to miss this book. The Ohio State University is synonymous with football success, with eight national championships and counting. Author Paul Keels, as the radio voice of the Buckeyes, has witnessed more than his fair share of that history up close and personal. Through singular anecdotes only Keels can tell as well as conversations with current and past players, this book provides fans with a one-of-a-kind, insider's look into the great moments, the lowlights, and everything in between. Ohio State die-hards will not want to miss this book. As the radio voice of the Calgary Flames from 1980 until his retirement in 2014, Peter Maher has witnessed more than his fair share of Flames action up close and personal--from the 1989 Stanley Cup championship to the individual brilliance of stars like Lanny McDonald, Al MacInnis, Theo Fleury, and Jarome Iginla. Through singular anecdotes only Maher can tell as well as conversations with current and past players, If These Walls Could Talk: Calgary Flames provides fans with a one-of-a-kind, insider's look into the great moments, the lowlights, and everything in between. No Flames fan will want to miss this book. The Boston Bruins are one of the most successful and historic teams in the NHL, with six Stanley Cup championships and counting. Author Dale Arnold, as a longtime broadcaster for the team, has gotten to witness more than his fair share of that history up close and personal. Through singular anecdotes only Arnold can tell as well as conversations with current and past players, this book provides fans with a one-of-a-kind, insider's look into the great moments, the lowlights, and everything in between. Bruins fans will not want to miss this book. As the radio voice of the San Jose Sharks since the team's inception, Dan Rusanowsky has witnessed more than his fair share of Sharks history up close and personal—from jaw-dropping playoff runs to the individual brilliance of stars like Owen Nolan, Patrick Marleau, Joe Thornton, and Joe Pavelski. Through singular anecdotes only Rusanowsky can tell as well as conversations with current and past players, If These Walls Could Talk: San Jose Sharks provides fans with a one-of-a-kind, insider's look into the great moments, the lowlights, and everything in between. No Shark Tank regular will want to miss this book. The Montreal Canadiens are one of the most successful teams in the NHL, with 24 Stanley Cup victories and stars like Guy LaFleur, Patrick Roy, and Carey Price, who have all left their mark on hockey history. Author Pat Hickey, as a longtime beat writer for the Montreal Gazette, has witnessed more than his fair share of that history up close and personal. Through singular anecdotes only Hickey can tell as well as conversations with current and past players, this book provides fans with a one-of-a-kind, insider's look into the great moments, the lowlights, and everything in between. Habs fans will not want to miss this book.